Best, Reliable, and Affordable ASP.NET AJAX Hosting solutions provided by ASPWebhosting.com.au with free ASP.NET Hosting offer for 45 days. Create next-generation interfaces with reusable AJAX Hosting components. Continue using Visual Studio 2005 to take your ASP.NET 2.0 Hosting sites to the next level. Access remote hosting services and data directly from the browser without writing a ton of complicated script. Enjoy the benefits of a free framework with 24x7 technical support provided by Microsoft. 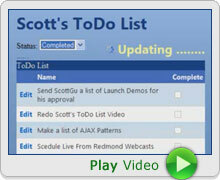 See how easy it is to build from scratch a "To Do List" management application using ASP.NET 2.0, and then enhance the user experience using the ASP.NET AJAX Extensions. Take your first steps toward learning Microsoft ASP.NET AJAX, from downloading and installing the framework to creating your first AJAX-style application. Learn how to extend your ASP.NET AJAX applications using the ASP.NET AJAX Control Toolkit. 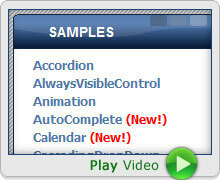 This video starts with the very basics, including downloading and installing the toolkit. Download and install ASP.NET AJAX Extensions today! This download installs the framework for developing and running AJAX-style applications with either server-centric or client-centric development models and is fully supported by Microsoft. 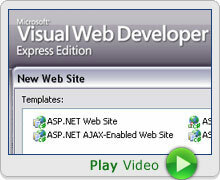 You must install this before installing the ASP.NET 2.0 AJAX Futures January CTP or the ASP.NET AJAX Control Toolkit. The ASP.NET AJAX Control Toolkit is a shared-source community project consisting of samples and components that make it easier than ever to work with AJAX-enabled controls and extenders. The Control Toolkit provides both ready-to-run samples and a powerful SDK to simplify creating custom ASP.NET AJAX controls and extenders. Make sure you install ASP.NET AJAX 1.0 first! The ASP.NET AJAX Futures January CTP provides features that extend the core ASP.NET AJAX 1.0 platform with additional functionality that remains under development. Together, these releases enable development scenarios supported in the earlier ASP.NET AJAX CTP releases with newly added features. Make sure you install ASP.NET AJAX 1.0 first!